Geology I (56 hours of instruction): This covered basic terrestrial mineralogy, petrology and geological processes, identifying basic rock structures and geological mapping techniques (a total of fourteen sessions in geological processes). Geology II (56 hours of instruction): Terrestrial analogues of lunar geographic features, geological mapping, geophysical studies and appropriate sampling techniques (fifteen sessions), plus fourteen sessions of mineralogy and petrology. 1. Grand Canyon, Arizona (2-3 June 1966). 2. West Texas (Marathon Basin and Santa Elena Canyon) (23 June 1966). 3. Bend, Oregon (Newberry Crater and Lava Butte) (27-29 July 1966). 4. Katmai, Alaska (Valley of The Thousand Smokes) (22-26 August 1966). 5. Los Alamos, New Mexico (Valles Caldera) (21-23 September 1966). 6. Pinacate Volcanic Area, Mexico (Cerro Colorado and Elegante Craters) (30 November-2 December 1966). 7. Hawaii (Island of) (week of 13 February 1967). 8. Flagstaff, Arizona (sunset Crater Area and Meteor Crater) (26-28 April 1967). 9. Medicine Lake Area, California (22-23 June 1967) and Iceland (Askja Caldera and Laki Fissure Area) (week of 3 July 1967). Astronomy (15 hours): Astronomical terminology, solar system and celestial sphere (five sessions); 9-10 June 1966 - field trip to Morehead Planetarium. Digital computers (8 hours): Digital computer components, operation, and programming techniques (four sessions). Medical aspects of space flight (17 hours): Physiology of the human body as affected by the space environment (six sessions). Flight mechanics (24 hours): Earth orbit, lunar, mid-course and entry mechanics (twelve sessions). 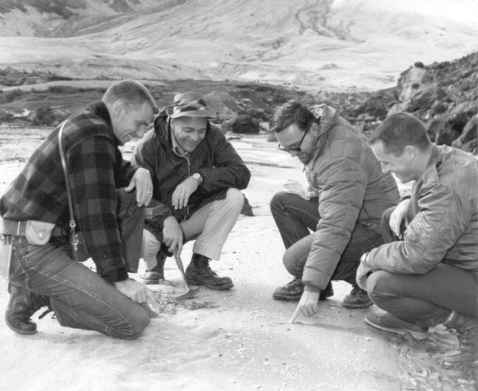 Gibson (right), Joe Engle (left) and Ron Evans (second left) study rhyolitic ash flow from Mount Trident with NASA Geologist Dr. Ted Foss during an August 1966 geological field trip to the Valley of Ten Smokes, Katmai National Monument, Alaska. Meteorology (4 hours): Meteorological considerations on space flight operations, global weather system observations (two sessions). Guidance and Navigation (34 hours): Apollo navigation techniques, functional description of the Apollo guidance and navigation system (seventeen sessions). Rocket Propulsion (8 hours): Rocket performance parameters, liquid rocket engine operation, solid propellant rocket operation, reaction control system operation (four sessions). 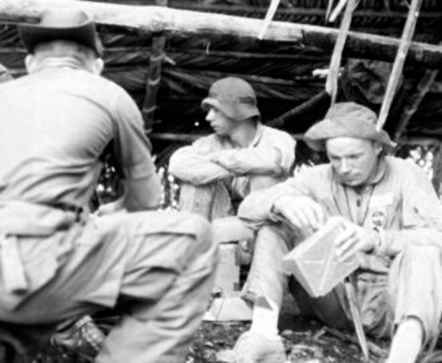 Communications (10 hours): Basic communications concepts, radio ranging, radio telemetry and Apollo telecommunications performance (five sessions). 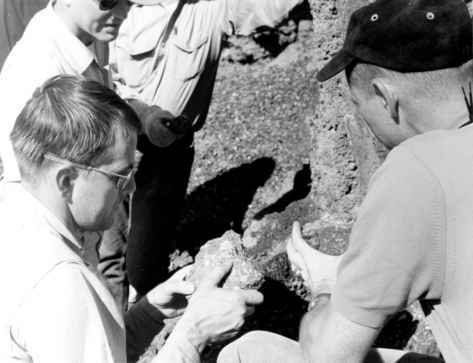 Michel studies rock samples during a November 1966 geological field trip to the Pinacate volcanic area in Sonora, Mexico. Physics of the Upper Atmosphere and Space (12 hours): The environment of the interplanetary medium and the sun's effect on this environment, the Earth's upper atmospheric condition and associated phenomena (six sessions). Michel was one of the lecturers on the topic of Upper Atmosphere and Space Physics to the rest of his group.